An article 4 direction is made by a local planning authority to restrict the scope of permitted development rights. This can be for a particular area or site, or for a specific type of development within the authority’s area. Article 4 directions are typically used to control works that could threaten the character of an area of acknowledged importance, such as a conservation area. 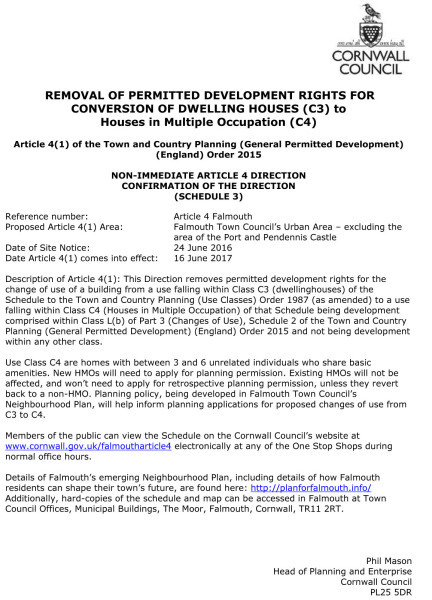 Once in effect an article 4 direction means a planning application will be required for development that would otherwise have been permitted. The government has issued guidance on when and how to make an article 4 direction (*Link). It says that local authorities should consider making article 4 directions only in those exceptional circumstances where the exercise of permitted development rights would harm local amenity, the historic environment or the proper planning of the area. The town's popularity and success also brings challenges. It has a diverse population with individual housing needs, all to be carefully balanced to ensure a sustainable community and a good quality of life, for all. During consultations 63% of the respondents (826) felt HMOs should be controlled via the planning process (using an ‘Article 4 Direction); and over half of respondents (696) gave additional views on the subject. Of these, 91% felt community balance and 81% felt the character of the area were being harmed. The Article 4 would require new HMOs that fall into the Dwelling Use Class C4 – “Houses in Multiple Occupation with between 3 and 6 unrelated individuals, who share basic amenities” – irrespective of the number of storeys, to apply for planning permission. The image to the right shows a copy of the necessary legal notices which were placed in more than 100 locations around the town during May 2016. These notices show the effective date of 16th June 2017. In brief, after this date, any building within Class C3 (dwelling houses) will need planning permissionto be able to change to Class C4 (a home with between 3 and 6 unrelated individuals who share basis amentities). This does not effect existing HMOs already needing a license - Generally these will be 3 or more storeys with 5 or more persons where there is some sharing of facilities.